Petrogale xanthopus is one of the brightest members of the kangaroo family. The upper body parts such as the head and face are a light brown-grayish color, shading to more grayish on the rump of the wallaby. A dark brown streak starting from the ears comes down to the middle of the back connecting with brown patches on the yellow limbs of the wallaby. On each of its cheeks is a white stripe with yellow on the back of the ears. The head and body are about 20-30 inches long, the tail is 15-28 inches long, and the weight of the wallaby is about 6-20 pounds. The Yellow-Footed Rock Wallaby breeds all year long when there is enough food. When drought arrives and food sources are low and the female cannot produce milk for her young, she abandons her joey (Joey means baby or young). If the female wallaby becomes pregnant while a joey is already in her womb, the embryo will not develop until the joey is out of the pouch. The periods of drought also determine the development of the new embryo. When it rains the embryo starts to develop automatically and then the joey is born and moves to the pouch of the mother. After the joey is born the mother mates again and another egg is fertilized to starts the cycle once again. The Yellow-Footed Rock Wallaby can jump from rock to rock. Once it lands it opens its short arms and holds them at an right angle to the body until it can balance itself. 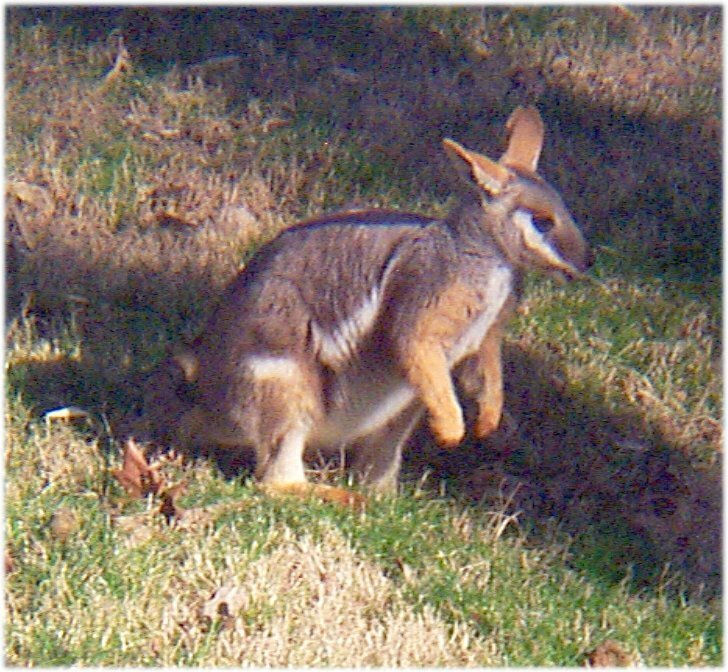 Comments about the Yellow-Footed Rock Wallaby of the Fort Worth Zoo. The Yellow-Footed Rock Wallaby spends much of its time in the shade during the hot weather. In the cool mornings and evening it spends much of its time eating grass and vegetable mixtures. When the wallaby is disturbed it stands rigidly, and beats its feet once or twice on the ground to warn other wallabies and to show its unease. 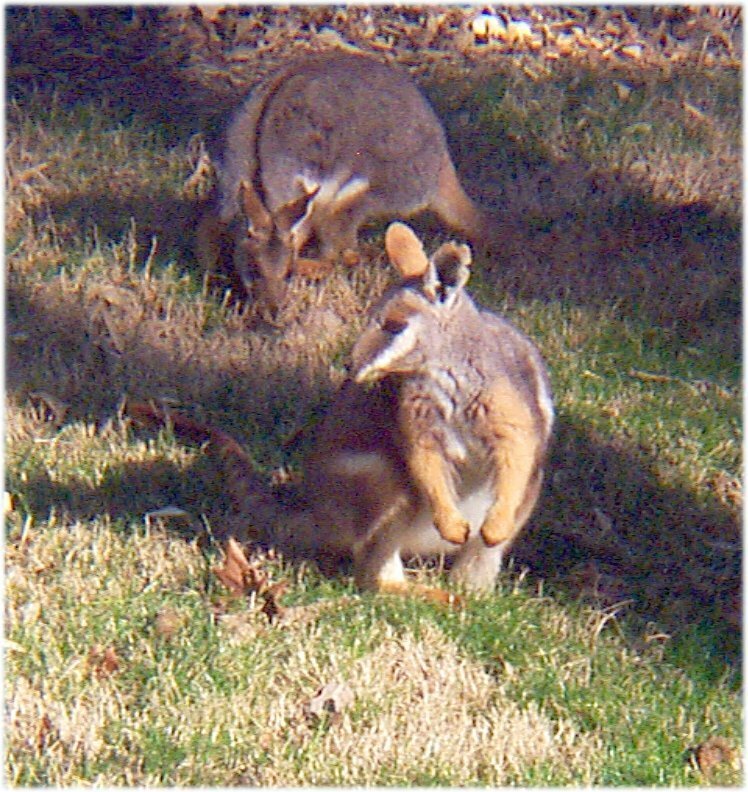 The Yellow-Footed Rock Wallaby mates year round when conditions are favorable. The gestation period is one month followed by eight months in the pouch. One egg can be fertilized at a time. Walker's Mammals of the World, 5th edn. Volume 1.